Wash the okra/ Bhindi and dry them. Take one okra pod at a time and slice off both the ends and make a slit length wise from top to bottom, taking precaution not to split the okra in two halves. On medium high heat in a non stick frying pan dry roast tsp sesame seeds/ Til, for 2-3 minutes,keep aside. On medium high heat add one tablespoons oil in a non stick frying ,add chopped onions and sauté them 6 to 7 minutes or until they become light golden brown. In a mixing bowl, take powdered coriander, red chili, turmeric, amchoor, fennel seed /saunf, sesame seeds/ Til and salt, mix. Add a table spoon oil to this dry spice mixture and mix well. Hold one okra/ Bhindi at a time in your left hand with the slit facing up. Insert your left thumb into the slit to open slightly, with your right hand take little masala and stuff the okra and spread evenly through the length, press the slit closed gently to secure the masala, and place them on a try. When all the okra’s/ Bhndis are stuffed, take a wide non stick pan and spread them all around the pan. Add tree table spoon oil and cover the pan, cook on a low heat. 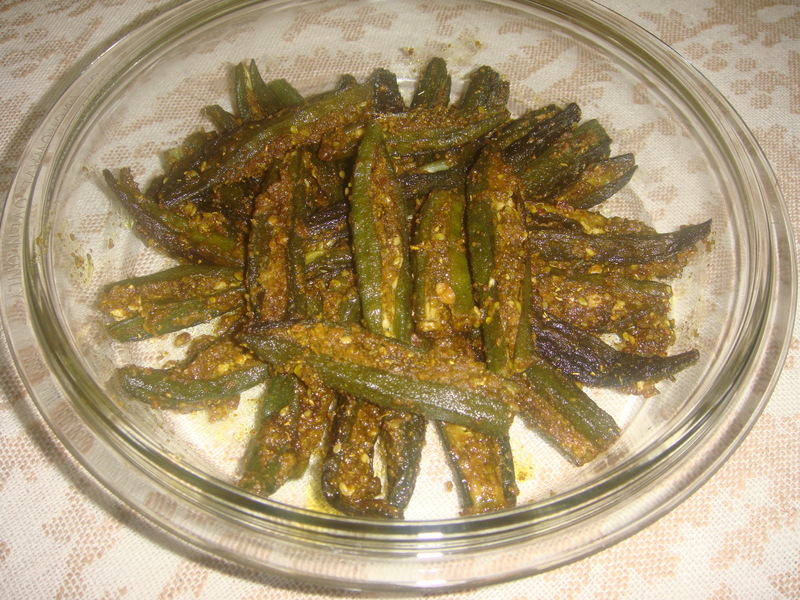 With a spatula turn the okras/ Bhindi every few minutes, so that okra cooks evenly and it prevents from burning. Once the okras/ Bhindi become tender, turn the stove off. Do not allow the Okra/ Bhindi to get mushy, it should hold the shape yet soft. Serve hot with lentils and all Indian breads.